Mulvane Wildcats Varsity defeated Clearwater 7-0 on Thursday as two pitchers combined to throw a shutout. Hunter Dye induced a groundout from Jaron Bluejacket to finish off the game. Mulvane Wildcats Varsity got on the board in the first inning when Mulvane Wildcats Varsity scored one run on a stolen base. Mulvane Wildcats Varsity notched three runs in the fourth inning. Mulvane Wildcats Varsity big bats were led by Brett Nelson and Nathan Klein, all driving in runs in the inning. One bright spot for Clearwater was a single by Corbin Lill in the first inning. Kyler VanderGiesen toed the rubber for Mulvane Wildcats Varsity. He lasted six innings, allowing seven hits and zero runs while striking out four. Blake Robinson started the game for Clearwater. He surrendered four runs on five hits over two innings, striking out one and walking one. Bryce Wiens and Taylor Currie entered the game from the bullpen, throwing three innings and two innings respectively. Mulvane Wildcats Varsity totaled 11 hits. Gage Gerlach, Ethan Booe, and Caleb Dameron all had multiple hits for Mulvane Wildcats Varsity. Gerlach led Mulvane Wildcats Varsity with three hits in four at bats. Mulvane Wildcats Varsity was sure-handed and didn't commit a single error. Klein made the most plays with five. Nelson led Mulvane Wildcats Varsity with three stolen bases, as they ran wild on the base paths with eight stolen bases. Clearwater saw the ball well today, racking up seven hits in the game. Lill and Bluejacket all managed multiple hits for Clearwater. Clearwater didn't commit a single error in the field. Jake Wellington had ten chances in the field, the most on the team. Mulvane Wildcats Varsity stayed in it until the end, but Clearwater pulled away late in an 8-6 victory on Thursday. Clearwater was down 6-5 in the bottom of the fifth inning when an error scored three runs for Clearwater. 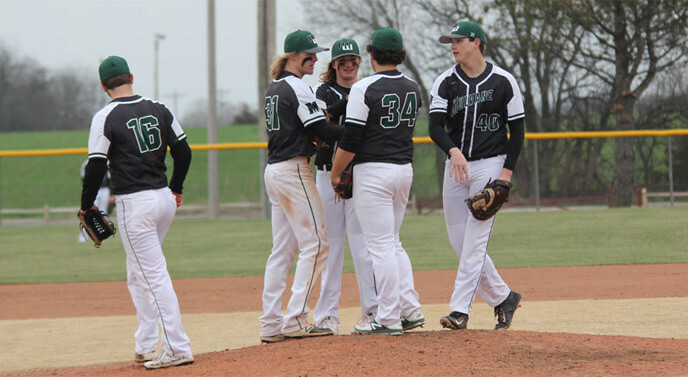 Mulvane Wildcats Varsity lost despite out-hitting Clearwater 12 to eight. Clearwater got things started in the first inning. Clearwater scored one run when Denton Demel doubled. Corbin Lill got the start for Clearwater. He surrendered three runs on seven hits over four innings, striking out two and walking one. Ethan Booe led things off on the hill for Mulvane Wildcats Varsity. He allowed seven hits and six runs over four and a third innings, striking out five and walking one. Hunter Dye and Jayden Price entered the game from the bullpen, throwing one inning and two-thirds of an inning respectively. Mulvane Wildcats Varsity tallied 12 hits. Nathan Klein, Cole Schmidt, Price, and Brett Nelson each managed multiple hits for Mulvane Wildcats Varsity. Klein led Mulvane Wildcats Varsity with three hits in four at bats. Clearwater collected eight hits on the day. Jake Wellington and Jaron Bluejacket all collected multiple hits for Clearwater. Wellington went 3-for-3 at the plate to lead Clearwater in hits.